The Charles B. Wang Center has a new attraction for lovers of Asian cuisine. 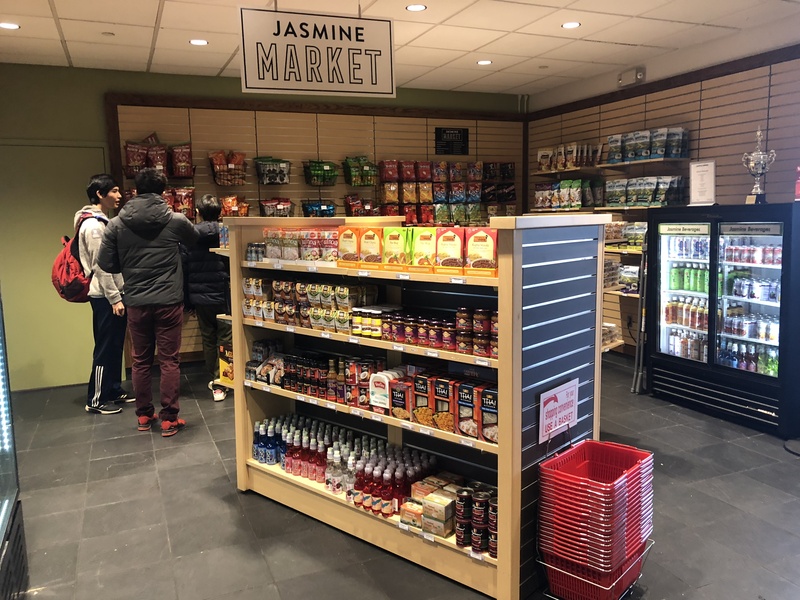 The new Jasmine Market has been open and ready for business since the first day of classes this semester for students to stop by and shop. Jasmine Market is located in a quaint spot in the corner of Jasmine food court, next to the Jasmine Tea House. They have snacks like shrimp crackers, Kasugai roasted hot green peas, Thai coconut rolls, Japanese green tea flavored chocolates, Korean Choco Pie, lychee flavored foods, Asian fruits (dragon fruit and Asian Pears), spices, sauces and flavorings, as well as the stereotypical college favorite food — ramen — in several flavors. “A majority of stuff could be cheaper, but there’s a variety of things that I feel like a lot of people would like,” Angel Lee, a junior computer engineering student that shopped at Jasmine Market, said. Students like Jessica Ju, a senior double major in technological systems management and linguistics, hasn’t purchased anything from the market but has browsed. “It can be a really convenient thing for students to get things they need to cook and eat,” Ju said. It’s not just about the delicious food. The market was based on the university demographics because the university has a significantly large Asian student population. As of Fall 2018, 36.4 percent of the university’s students are Asian according to university enrollment data. Agnello says the FSA was prompted by the student population to create the Jasmine Market on campus. The FSA and Campus Dining are now prompting students to participate in their surveys again for next year. “Plans are already underway for new options for next fall so keep the feedback coming! You can always submit feedback online to let Campus Dining know your favorite dining venues and menu options as well as discuss new items you would like to see featured,” Agnello said. If you find yourself near the Wang Center, don’t miss the opportunity to treat yourself to the wonderful food offered at the Jasmine Market. There are treats that besides being delicious are also aesthetically pleasing. They have cute sweet treats like Chocorooms, a mushroom-shaped chocolate cracker. “They made a really conscious effort to try and keep us in touch with the culture. There’s a lot of variety in there from what I saw and in the future, I’ll definitely buy something,” Ju said.